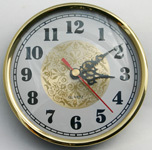 Quartz clock 180mm diameter face, insert type, brass bezel, white colour face, Arabic Numerals. Face with fancy centre disc gold and gold colour over lay. Method of mounting is three metal spring clips, push fit.